250 gm. Indian cheese or Paneer. You can buy ready made paneer from most supermarkets & Indian stores. Peel, wash, chop onion, ginger and garlic roughly, grind in a food processor. Cut paneer cheese into cubes. You can add them to the dish as they are or deep fry them as in 2nd picture; heat oil to hot, but not smoking. Add paneer cubes and fry, turning them gently, until light brown. Drain on a kitchen paper. Keep aside. Add cumin seeds, a large pinch of asafoetida & let the seed splutter, not burn. Add chopped onions, ginger garlic and & fry till medium brown and oil separates. Add tomatoes, coriander powder, turmeric, salt and chillies. Cook, stirring frequently, until oil begins to separate from the gravy. Add the peas, mix thoroughly, and add enough water (or milk-see notes), to cover the peas. Bring to boil on full heat, then cover and simmer for 5 minutes, longer if fresh peas are used. If using milk, cooked uncovered, to stop milk from boiling over. Add paneer/cheese squares, cover and simmer for 5 more minutes. Paneer absorbs liquid and becomes soft. Adjust seasoning and thickness of gravy to your choice. Turn heat off. If using cream, stir it in here. Add chopped coriander and a little garam masala and mix. If you like matar paneer creamy like in restaurants, you can either add 2 tbsp. 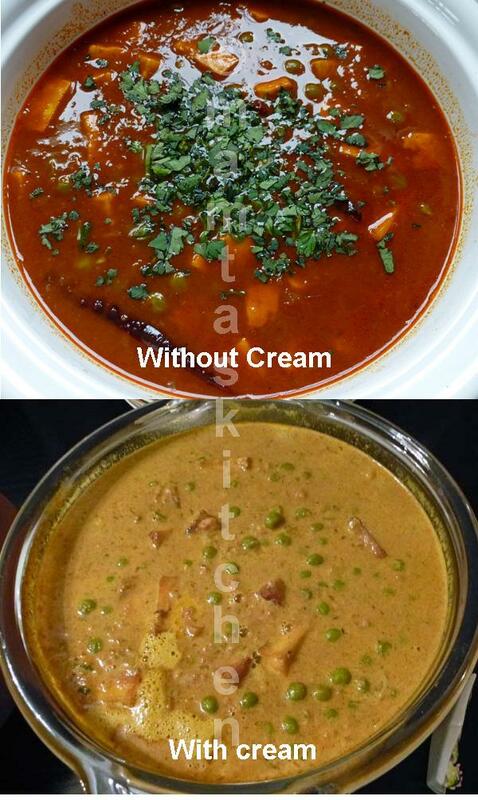 of double cream at the end of cooking or add milk, instead of water. It is possible to use Tofu instead of paneer, but the taste will be a little different. Cut tofu into bite size squares. Shallow fry on both sides in a non-stick frying pan, until lightly brown. Use as paneer.